I’ve gotten a lot of radishes in my baskets, and for the most part, I unimaginatively chop them up and toss them in a green salad. This week’s variety definitely looked different than the little round, red radishes I had been accustomed to seeing, so I was excited when I learned that their mild flavor made them ideal for a cooked radish dish. It’s a basic sautéed dish: halve or quarter your radishes, and cook in a pan with some butter and a little olive oil until the radishes are translucent, or even a bit browned as I preferred. They are crispy, but with a mellow flavor that doesn’t bite back. 1. Trim and wash radishes. Slice smaller radishes in half or quarter larger radishes. 2. Heat butter and olive oil in skillet until butter begins to foam. 3. Add radishes and cook until they are slightly translucent. 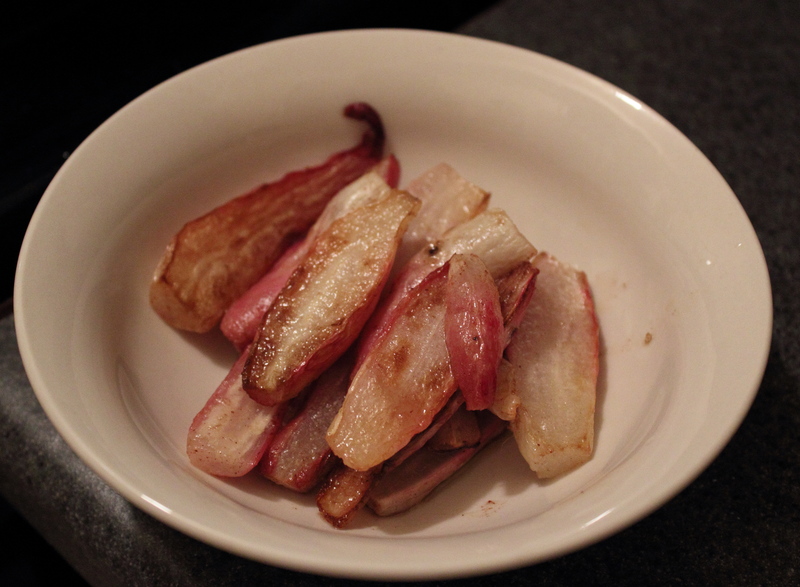 For a more fried flavor, cook until radishes are slightly browned. 4. Season with salt and pepper, and serve sprinkled with fresh cut chives, if desired. Never heard of these . . . but they look and sound tasty!